When a User Space process performs an illegal operation (e.g., trying to access a memory cell that does not belong to the allocated range of memory cells), then the Linux kernel closes the process, and the process crashes from the user's point of view. Obviously, in such an unexpected state, it is not possible to create any logs about the exact events that led to the crash. To identify the root cause of such crashes, developers invented a simple mechanism that allows the user to dump (write a file to the disk) the whole content of the memory that was used by the User Space process. Such files are called Core Dump files. Generation of User Mode core dump files on Linux OS has to be enabled each time the machine boots using the 'ulimit -c unlimited' command (for more information about the shell built-in command ulimit, refer to the shell manual page). um_core enable command generates the /etc/sysconfig/enable_cores file. um_core disable command deletes the /etc/sysconfig/enable_cores file. /etc/initscript start-up script checks whether the /etc/sysconfig/enable_cores file exists. If this file exists, then it runs the ulimit -c unlimited command. Note: For more information about the um_core command, refer to sk18307: Enabling the generation of User Mode core dump files on SecurePlatform OS. In Gaia OS, the /etc/sysconfig/enable_cores file always exists on the system. Starting in R75.47 and R76, the mechanism that configures the Linux kernel to generate and process the User Mode core dump files was improved. Limit the total amount of disk space used by core dump files. Limit the number of core dump files per process. Both these limits can be configured by the user in Clish or in Gaia Portal. This tells the Linux kernel to dump the core file into /var/log/dump/usermode/ProcessName.PID.core, and pipe this core file to the /etc/coredump/compress.sh shell script (the process's executable name and its PID are provided as arguments). Checks whether CDM is enabled. If CDM is enabled, then this script continues to the next step. If the /etc/coredump/proclist.conf file exists on the machine, then the process, for which the core file was dumped, is checked against this list. For each process listed in the /etc/coredump/proclist.conf file, the core dump file will be GZIPed (compressed) in /var/log/dump/usermode/. Core dump files from processes that are not listed in the file are not compressed. Runs the CDM (/bin/cdm) that performs the necessary operations based on its configuration file - /etc/coredump/cdm.conf. Important Note: Users should not edit the /etc/coredump/cdm.conf file manually. This file must hold the same limits that were configured in the Gaia OS database /config/db/initial. Open the Gaia Portal in your web browser. Note: Refer to sk92668 (Browsers supported to work with Gaia Portal). Obtain the lock over the configuration database (click on the padlock icon at the top). Go to the System Maintenance pane - go to the Core Dump section. 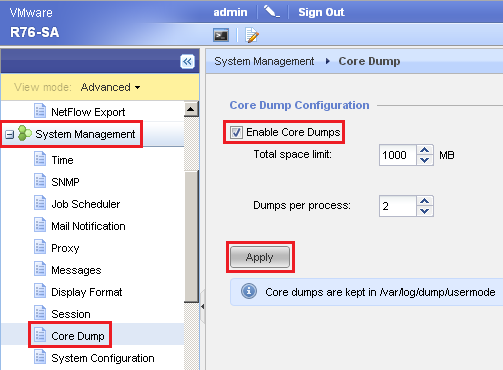 Check the box Enable Core Dumps. There is no need to reboot. These settings also apply to processes that are already running. Note: There is no need to reboot. These settings also apply to processes that are already running. The CDM binary file is located in /bin/cdm. CDM has a strict rule (hard coded) to erase core dump files if free disk space is below 200 MB. If the binary file that has crashed is the CDM executable file /bin/cdm, then the CDM will abort its execution to prevent a loop of crashes and generation of core dump files.